Paul Weller At Sherwood Pines! – Paul Weller News! Paul Weller At Sherwood Pines! 1 Comment on Paul Weller At Sherwood Pines! Paul Weller started off his run of Forest Live concerts at Sherwood Forest. By all accounts, it was a wonderful evening. Paul Weller kicked off his run of Forest Live shows with a storming performance at Sherwood Pines, Nottingham. Fresh from his European dates, the Modfather played a set featuring two encores, supported by young up-and-coming groups The Merrylees and The Rails. But the night belonged to a rejuvinated Weller, who played a variety of hits from his long career. His set started with three staples of his recent live performamces; Sunflower, From the Floorboards Up and Wake Up The Nation. These powerfully-riffed songs were followed by 2010’s Fast Car/Slow Traffic, and another offering from 2005’s As Is Now, Come On/Let’s Go. The crowd’s volume was brought right back up following the superb Sea Spray from 2008’s 22 Dreams and That Dangerous Age, by the one Style Council song played, My Ever Changing Moods. In the Forests where Robin Hood stole from the rich and gave to the poor, Weller fans could have been forgiven for hoping for more than this solitary Style Council number, however it got the fans up and dancing, especially with Weller’s vocal featuring the full final, faded verse from the 12″ single release. The set advanced with Foot Of The Mountain, an exquisite number taken from Wild Wood; surprising perhaps that the title track was omitted considering the surroundings. Next, the first of three Jam songs again raised the tempo, with lesser-known B-side Tales From The Riverbank failing to spark the whole crowd into the raptures that would follow but nonetheless providing a nice mellow sound as the evening wore on and darkness began to descend on the forest clearing, with some dark cloud at times encroaching on the blue sky, which rarely, however, threatened rain. Next came recent fan-favourite The Attic, followed by Going Places, from the album Illumination, which Weller admitted during one of his few spoken interjections, was “not much cop” aside from this song. Dressed in a dark blue, long sleeved top with light coloured trousers, Weller was finding his voice by this point, using all of his stage space. What followed was perhaps the night’s best performance, a stunning, all-action rendition of Friday Street. Drummer Steve Pilgrim was superb on the sticks all night, and this track proved no exception. Buoyed by this, Porcelain Gods followed, with an interesting use of effects (following on from the experimentation with Aim High at Bush Hall last month). Vocally, this was as good as Weller got, a sublime performance. 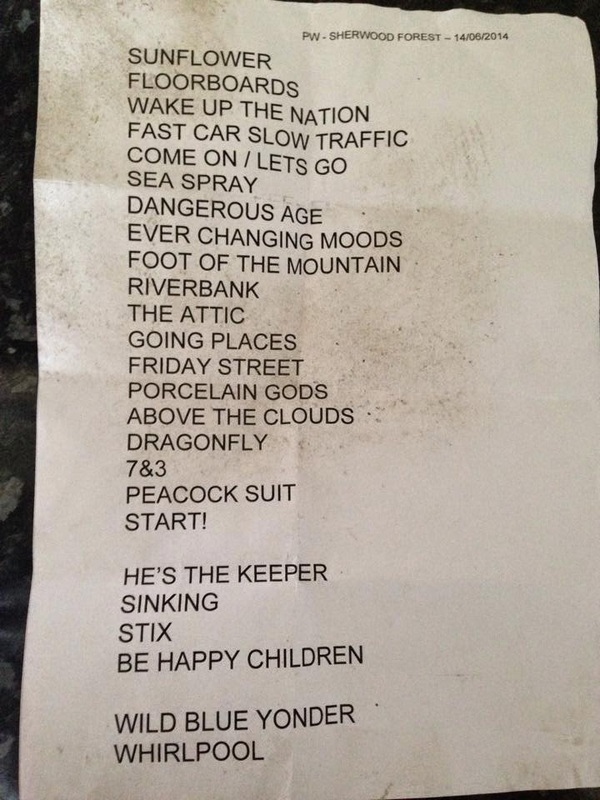 A mellow version of Above The Clouds was next, before Weller switched his guitar for a keyboard to do Dragonfly, the song based on daughter Jessie’s poem, in the week where wife Hannah threw her weight behind a campaign to protect the privacy of children. The extended playing of Weller really added something to the song just not captured in the single release. Throughout the gig, Weller and right-hand-man Steve Cradock, dressed smartly in a grey suit, regularly went to the side of the stage to swap guitars, with electric and acoustic equipment used. After Dragonfly came another more recent single, 7&3 Is The Striker’s Name, with Weller back playing his more familiar instrument. This led into the first of the two final songs in the main set, Peacock Suit. This gritty version raised the volume levels once again, before Jam classic Start! left fans happy. However, as the stage emptied, long after some of the sell-out crowd had inexplicably left (perhaps for the football), a chorus of whistles rung around the standing-only area by the stage. Weller knew what to do, so no-one was surprised when he re-emerged, explaining that the first track of his encore would be He’s The Keeper, written for Small Faces legend Ronnie Lane (incidentally the opener of More Modern Classics, of course). This was followed by a glorious extended version of classic track Out Of The Sinking, with the end of the song giving Weller a chance to thank his band, including “the very lovely Andy Lewis” on bass guitar, before he moved across to a keyboard for the second time to give Heliocentric fans another track from that album, Picking Up Sticks. It was towards the end of this that Pilgrim was allowed a drum solo, perhaps not as brash as last year at Thetford Forest but impressive nonetheless. Weller stayed put at the keyboard to end this segment with a rendition of Be Happy Children, featuring the piped voices of his offspring, with daughter Leah’s album contribution replaced with a male vocal. The star moments of the evening were, however, yet to come. Re-emerging from the left of the stage for a second time, Weller and the band proceeded to play two stunning tracks to bring the house down; Weller’s personal favourite Whirlpool’s End, and Jam classic Town Called Malice, complete with customary sing-along. And with those two giving a stirring finish to the evening, the crowds headed home. Ten years to the day after Weller released his cover of Gil Scott-Heron’s classic The Bottle, there were no covers included in his set this time. Malice replaced The Changingman as the final song from his recent European tour, and also Wild Blue Yonder was culled. However, 25 songs is not bad value for money. 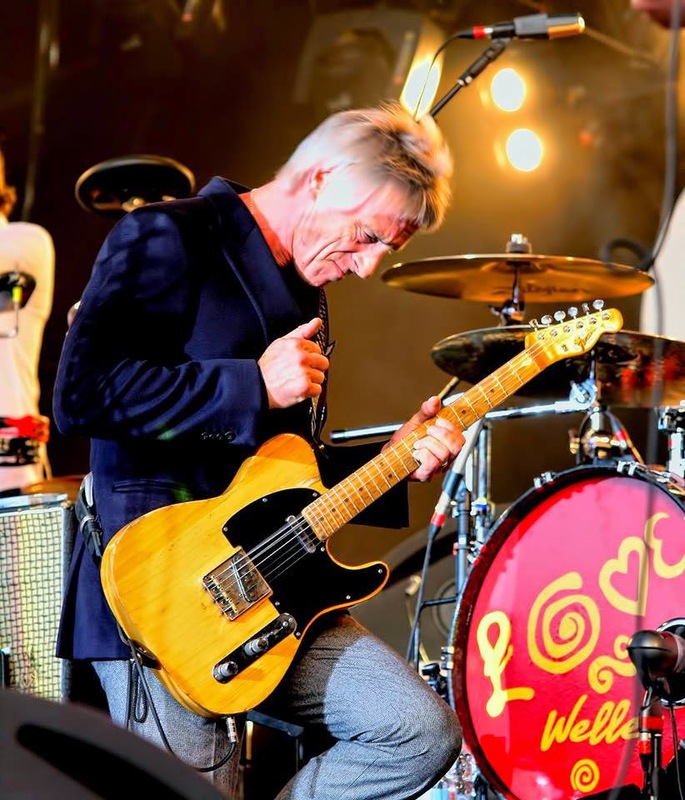 Weller’s performance, and lack of reliance on his best known solo work, surely proved to any doubters that he is at the top of his game right now, and a new album is hotly anticipated. Weller now plays Kent’s Bedgebury Pinetum on Saturday as his next forest stop, before heading on to Dublin’s Royal Hospital next Tuesday. In the 14th year of the Forestry Commission’s Forest Live gigs, Weller remains one of the most-seen artists, behind founder Jools Holland, his first appearance coming in 2004. Weller will play four more forest dates this summer. Previous Entry The Style Council – Mr. Cool’s Dream Book Released! Our Interview With Author Iain Munn! Next Entry The Who’s Roger Daltrey Joins Paul Weller On Stage At Bedgebury Forest!